MidPoint Music Festival, known to music fans as MPMF, returns to Cincinnati’s city center this week. Starting on Thursday, September 25, the three-day festival will take over local venues and bars with 150 acts from seven countries and 57 cities, including a great lineup of Cincinnati bands. Unlike music festivals that take place in empty fields, like Bonnaroo and Lollapalooza, MPMF lives and breathes within Cincinnati’s urban core. This year, the festival will host 14 stages among 12 venues in bars, restaurants, concert halls, and nightclubs throughout Over-the-Rhine and Downtown. The 2014 festival footprint will look slightly different than in years’ past, featuring the addition of numerous new venues and the elimination of several familiar stages. 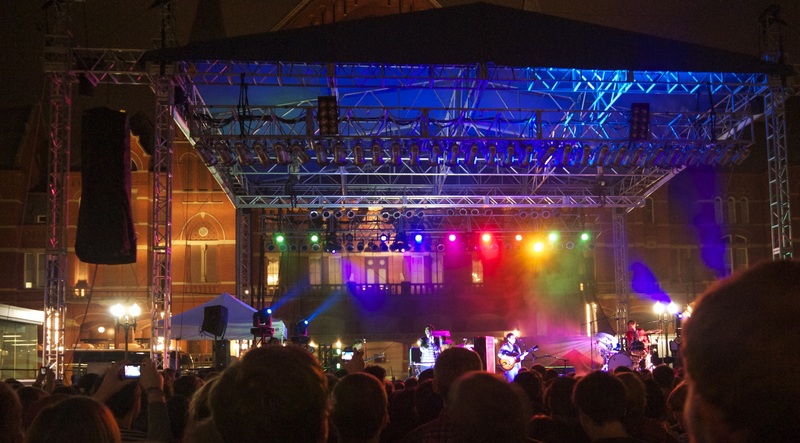 Since the festival relies on small businesses to host its live performances, the increasing popularity of Over-the-Rhine has, ironically, proven bittersweet for MidPoint’s festival organizers. Dan Bockrath, CityBeat publisher and de facto executive producer of MidPoint Music Festival, explained that as Over-the-Rhine evolves, the festival has to change with it. “When [CityBeat] first took over MidPoint [in 2008], there were a lot of empty storefronts that we could put to work, and there were a lot of rooms that served other functions typically that we could repurpose for MidPoint weekend. Now it’s getting a little more challenging to do that because Over-the-Rhine’s filled out,” Bockrath told UrbanCincy. Now with Grammer’s under construction, MPMF had to find a new outdoor venue to host their bigger acts. This year the festival inched north of Liberty Street to Moerlein Brewing Company where they’ll have two stages: a larger outdoor stage that can hold roughly 1,500 people, and a secondary indoor stage for more intimate shows. Other long-time MPMF venues have opted out of the festival as to not alienate the loyal customer bases they’ve built over the years. This will be the first year, for example, that Below Zero Lounge is not participating as a venue since 2007. “Businesses don’t want to abandon their successful business models now that they’ve built a loyal following,” Bockrath explained. But as some opportunities go away, others seem to be coming online almost equally. One example organizers give is the Cincinnati Streetcar, which will allow for all kinds of new possibilities once it opens in advance of Midpoint’s 2016 festival. While the streetcar has not significantly impacted the layout of this year’s festival, the same can’t be said for 2015. For instance, the MidPoint Midway on 12th Street between Vine and Walnut sits right on the streetcar line. The free programming area which, since 2011, has hosted the ArtWorks Box Truck Carnival, the Powerhouse Poster Expo, and this year’s ArtWorks programming around the theme “Ink Your Love,” may need to find a new home next year or, perhaps, this may be its last year. Either way, Bockrath remains optimistic. Tickets for MPMF are available online at mpmf.com/tickets, and a comprehensive review of each artist can be found on CityBeat’s website. Was almost called Mid by Midwest? Founders Sean Rhiney and Bill Donabedian eventually landed on MidPoint Music Festival. Launched with only 12 venues, but across three cities? In 2002, the inaugural festival hosted 12 venues in Newport, Covington and Cincinnati, including Newport’s Southgate House (not to be confused with Southgate House Revival) and York Street Cafe, Madison Theater in Covington, and now defunct OTR spots Kaldi’s, BarrelHouse, Crush, The Cavern (now Below Zero Lounge) and Jefferson Hall (on Main Street, before it moved across the river and back across again). Used to coincide with a music industry conference? Much like South by Southwest, the industry conference featured panel discussions, artist and industry keynotes and a trade show. Past keynote speakers included Big Star drummer Jody Stephens (2003), Everclear frontman Art Alexakis (2004), Afghan Whigs and Twilight Singers frontman Greg Dulli (2005), CD Baby founder Derek Sivers (2006), Superdrag vocalist and songwriter, John Davis (2007) and Minor Threat guitarist, Lyle Preslar (2007). Used to be four days long? The festival spanned across four days of live music and panels, but was condensed into three days when CityBeat acquired the festival in 2008. Once hosted 25 stages, the most venues MPMF has ever had in one year? In 2010 MPMF expanded to empty storefronts and spaces like the Hanke Building and non-music venues like the Tax Place, ArtWorks, the Segway Room, and the Inner Peace Center. Bike: BYOB (Bring Your Own Bike) – the festival has partnered with the City of Cincinnati to provide temporary bike racks adjacent to nearly every venue. You could also get around by using Cincy Red Bike for just $8/day for unlimited trips of 60 minutes or less. There are 19 Cincy Red Bike stations between OTR and Downtown, including at Washington Park, near the Midway at 12th & Vine, and by the Taft Theater at Broadway. Car: Uber is offering first-time Uber users a discount during MPMF. Just use the promo code MPMF14 to receive a discount of up to $20 off. Foot: The distance from MPMF’s northernmost venue (Moerlein Brewing Co.) to its southermost venue (Mainstay Rock Bar) is a little over a mile, so it’s totally doable to hoof it, though it’s bit of a trek if you’ve got a tight schedule. Transit: Most of the venues for this year’s festival are located on Metro bus routes, but many are within a short walk of a number of bus lines. You can check out which routes and stops are most convenient for you by using Google Map’s transit feature or Metro’s Trip Planner. On top of all the official MPMF activities, there are a number of complimentary events that will be taking place. On September 24, Christian Moerlein Brewing Co. will be hosting a preview party with a free show by THE PASS and Machines Are People Too. The event will run from 8pm to 11pm and also include a ceremonial keg tapping of Moerlein’s seasonal Helltown Rye. On Friday and Saturday, FRCH Design Worldwide will host Framed at MidPoint at the Frameshop (1317 Main Street). The pop-up event will include a photo booth, postcard gallery, sculptures made of instruments and a missed-connections space titled You’ve Been Framed. Donations benefit Music Resource Center, a nonprofit that helps provide youth with musical resources. Open Thursday through Saturday from 7pm to 12am. In addition to all of that, MPMF.FM will feature free daytime performances by MPMF bands at Findlay Market all weekend.